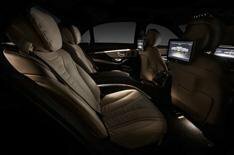 2013 Mercedes S-Class interior revealed | What Car? Full details and images of the 2013 Mercedes S-Class interior have been released. There is a clear nod to the simple layout of the current car, but curving architecture and a clear focus on media integration and a fresher, more modern finish are now the defining characteristics. The S-Class will be available in long- and short-wheelbase variants, and can be fitted with a static three-seat bench in the rear, or two individual seats that one company source claimed housed 'up to 30 motors' to ensure maximum comfort. Theres even the option of heated and cooled cupholders, and aircraft-style folding tables, as well as six massage modes including hot-stone functions. A standard, high-definition 12.3-inch colour screen appears to float at the top of the dashboard. As with the current car, the system is navigated using a rotary controller and various shortcut buttons, rather than the touch-screens favoured by most rivals. A free App will also be available iPhone-only initially that can be used to control the media and navigation elements. If the rear entertainment system is fitted, it means that all four occupants can access and independently control any element of the media system Google maps-linked navigation, DVD, TV, hard-drive, CD and USB input separately from each other. There will be a two-spoke wheel that is unique to the S-Class, as well as a high-definition screen that displays the digital speedo and rev-counter both very similar in style to the simple, classic look of the current cars readouts. Safety has been improved, with innovations including an inflatable seatbelt that helps to reduce the strain on occupants ribcage in an impact. Mercedes standard attention-detection system has also been upgraded, now giving a five-bar readout showing how much or little attention the driver is paying. The standard audio system gets 10 speakers, or two optional systems developed by German audio company, Burmester, feature 14 or 24 speakers. All audio systems feature two woofers that are built into the cars architecture and use a 40-litre space within the structure as a resonance chamber. A perfume atomiser that is hidden in the glovebox and features four unique fragrances is also a first for Mercedes, as is an interior warming function that includes heated elements in the door-mounted and centre-console armrests, as well as in the seats and steering wheel. Pricing and standard equipment details are yet to be confirmed, but the new Mercedes S-Class will have its full public debut in May, with UK sales beginning at the end of the year.